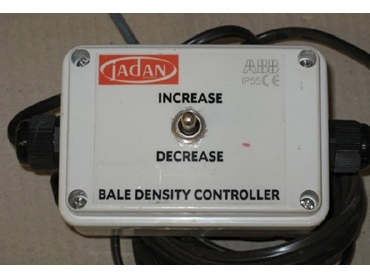 Bale density controllers available from Jadan Enterprises give baler operators complete control of the density settings of the baler from the cab. Designed to be fitted to any hydraulic baler density control, Jadan bale density controllers can be used on Massey, Case and most models of New Holland small square balers. When used in conjunction with the Jadan small bale accumulator scales, the bale density controller provides the baler operator with superior management ability and control from the cab. Jadan bale density controllers ensure consistent weight and form during bale manufacturing as bales are sold by number and not by weight. Consistency in weight and form thanks to Jadan’s bale accumulator scales and in cab bale density control will ensure product quality and customer satisfaction. The bale density controller kit comes complete with cab module switch, baler module and baler specific mounting bracket, grub screw fitted pulleys and belt as well as comprehensive installation instructions.